The advent of social media over the past two decades has immensely changed the way people communicate and interact with others as well with businesses they follow. Before the social media networks became popular, the only way business can interact with their market is through email and other traditional medium such as direct mail and telephone. Today, from multinational companies to fresh startups now have the opportunity to bring their brand closer to their target audience. In the recent years, several developments and changes in social media platforms have took place which enabled marketers to accurately target their preferred audience based on interest, location, lifestyle, and other important factors that will increase their chance of making sales. As a changing platform, there are a lot of shifts and trends in social media that salespeople must be aware to help them become more effective marketer. Knowing what techniques are most effective will not only bring your brand closer to your audience, but also help build a better relationship with your target customers in mind. 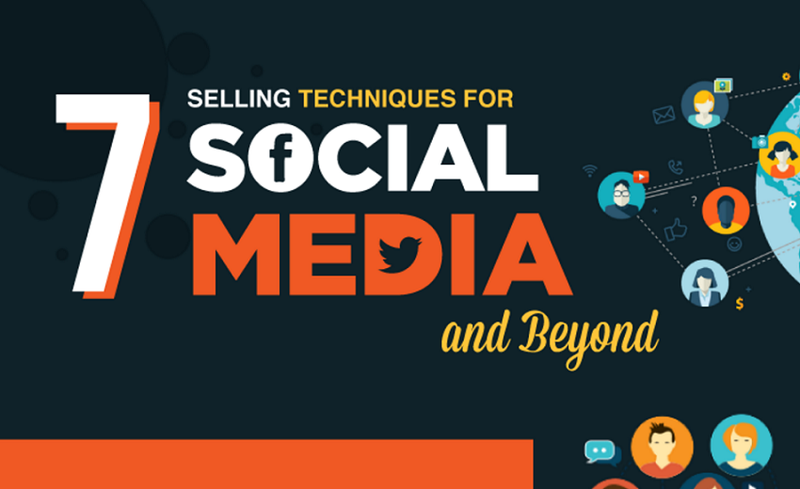 In this infographic from Healthy Business Builder you'll discover seven selling techniques for social media. Choose the social platform relevant to your prospects. Join or establish a community. Connect with the right individuals. List down relevant companies and follow them. Get the information you need at the right time.